RoboNation, in partnership with the Naval Postgraduate School and Open Robotics, announced today that applications are now being accepted for the Virtual RobotX Competition (VRX). 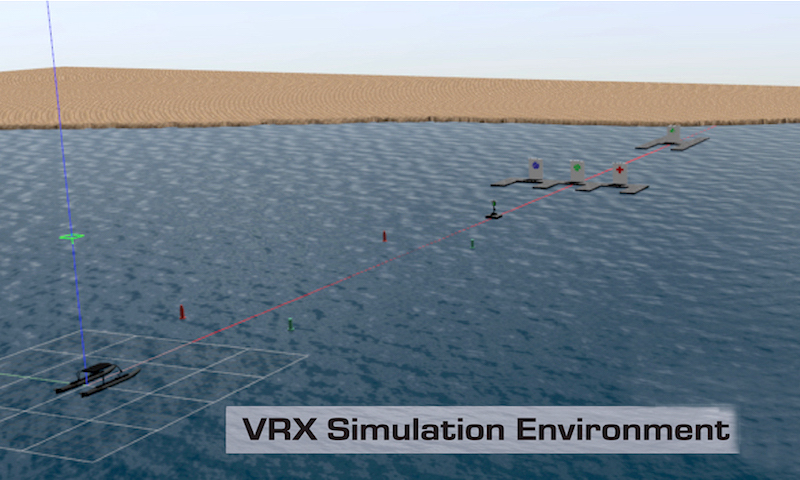 Sponsored by the Office of Naval Research (ONR), the VRX competition is an international, university-level effort designed to broaden students’ exposure to autonomy and maritime robotic technologies. In the VRX competition, student teams will operate their vehicle in a Gazebo-based simulation environment built by Open Robotics and the Naval Postgraduate School. Students will be tasked to develop innovative solutions to ensure their virtual Unmanned Surface Vehicle (USV) can perform prescribed tasks in this environment. Tasks for this competition have been derived from RoboNation’s Maritime RobotX Challenge. Applications are being accepted here. Access all rules and supporting documents, simulation environment and forum on the VRX site. “This is a very unique simulation environment and one that we are excited about creating”, according to Carlos Agüero, Research Engineer at Open Robotics. “We are very excited to see how the teams perform with their simulated USVs”. “The Virtual RobotX competition, as part of the larger Maritime RobotX Program, is designed to give students the opportunity to improve their vehicles’ performance”, says RoboNation Executive Director Daryl Davidson. “The solutions the teams develop in the VRX competition will aid their performance when competing in a real-world environment at the biennial RobotX Challenge, to be held in Hawaii in 2020”.